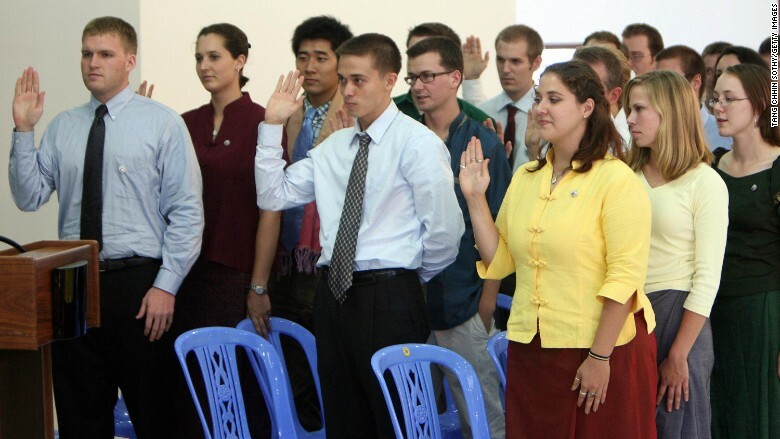 Volunteers are sworn in to the Peace Corps. Service in the Peace Corps is on the rise. The organization's director said Wednesday that the organization received nearly 23,000 applications, the most since 1975. Director Carrie Hessler-Radelet announced the milestone on the steps of the University of Michigan. The announcement was made in the same spot where John F. Kennedy first urged students to serve others through peaceful means 55 years ago. At the time, he was only a senator. When he became president in 1961, Kennedy signed an executive order creating the Peace Corps. The two-year volunteer program is known for placing Americans in service locations overseas. Nearly 220,000 Americans have served in 140 countries since it was established. This year's increase is part of a growing trend for the Peace Corps. In 2014, applications shot up by 32% -- marking a 22-year high of more than 17,000 Americans. "What these application numbers tell us is that Americans today are as passionate about service as they have ever been," Hessler-Radelet said. The increase is also due in part to reforms in the organization's application process. Last July, the Corps decided to allow applicants to choose the country they'd be sent to and to apply to specific programs. The application process was shortened and now takes only about an hour to complete. "The goal of our application reforms was to break down barriers to service for a new generation of Americans who are interested in not just imagining a better world but rolling up their sleeves and doing something about it," Hessler-Radelet said.